Update: I’ve merged BlazeBench and Census into a single demo. There is a known bug in in Firefox 3 due to a change in IFrame handling. To start the test when using FF3 you need to click on the results panel. Today Adobe released BlazeDS, an open source Java implementation of AMF based remoting and messaging. This is huge news for the Flex, Flash, Adobe AIR and Java communities! I can’t wait to break the news with Bruce Eckel in a few hours at the JavaPolis day 2 Keynote! Check out the press release. And go download the bits. 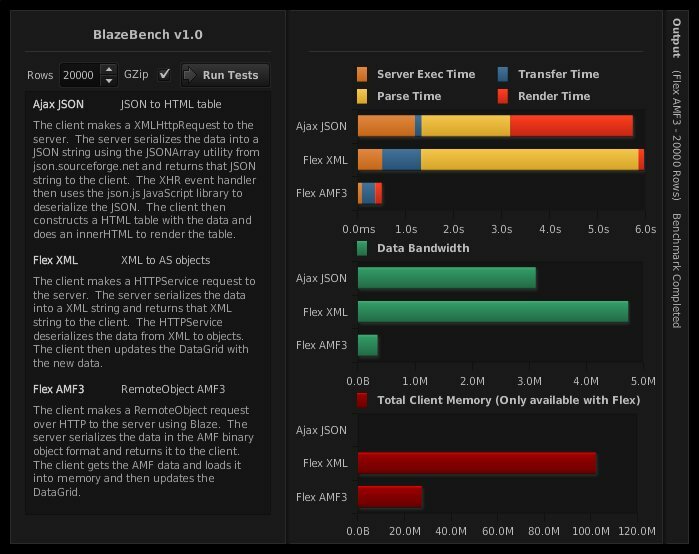 And take a look at my new BlazeBench application which shows why you want AMF and BlazeDS. Right-click on the application to find the source code on SourceForge. I’ll roll out a binary and source build in the next week or so. We have also officially published the AMF spec!